The Western Han Empire initiated Silk Road trading by sending silk traders westward. The Silk Road trade route was initiated about 2,100 years ago for trade and travel from China&apos;s Han Empire to Central Asia and Europe, and it revolutionized the world until it declined about the year 1368. The Chinese government is staking China&apos;s future on an ambitious trillion dollar plan for infrastructure development for a new Silk Road, and Silk Road trade, travel, and tourism is booming once again. What Was China&apos;s Silk Road? The Silk Road was the world&apos;s most significant trade route that connected East and West for two thousand years. It started in the Yellow River basin where China&apos;s first civilizations developed. From ancient Chinese capitals, Xi&apos;an and Luoyang, it passed through the arid Gansu Corridor and remote west of China, and beyond to Central Asia and Europe. Paper technology enabled the scientific and industrial revolutions in Europe. Trade and travel between east and west caused revolutionary changes in everything from culture, religion, and technology to the emergence of huge empires and the disappearance of many small tribes, kingdoms, and empires. 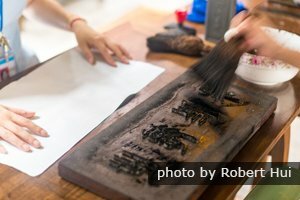 The inventions of paper and gunpowder in China were so powerful that when the technology reached Europe, it enabled the Renaissance, the Protestant Reformation, and the scientific and industrial revolutions that transformed the world. Paper enabled rapid publication, and gunpowder weapons changed warfare and enabled the destruction of older empires and the emergence of new nations. Plagues spread and destroyed half the population in large regions of Eurasia and new crops and technologies allowed the population in Eurasia to grow rapidly. The Mongol invasions on the Silk Road routes imprinted Mongol ethnicity and language from Xinjiang to Eastern Europe. Two of China&apos;s major religions, Buddhism and Islam, were introduced mainly via the Silk Road. 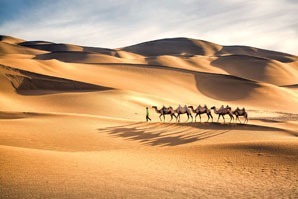 Camels proved very useful for transporting products through arid regions of Central Asia. 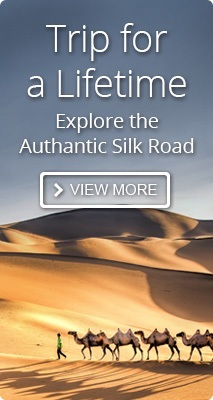 The Silk Road trade continued over a 1,500 year period. It began during the Han Empire (206 BC–220 AD) period. In 139 BC, Emperor Wudi (156–87 BC) sent out Zhang Qian (200–114 BC) to lead an embassy into Central Asia. He established diplomatic relations, and the Han sent the first trade caravans through Xinjiang. Trade grew and declined, and it reached a height when the Mongols had control of Eurasia from the Yuan Empire (1279–1368) to Eastern Europe. The fall of the Yuan Empire and the growth of maritime trade ended Silk Road trading. For more, see The History of the Silk Road in China. Click for more Silk Road maps. There were actually 5 “Silk Roads” from China to Europe. The main route went from Xi&apos;an/Luoyang, the capital of the Han Empire, through the Gansu Corridor to Dunhuang and Kashgar, across Central Asia to Europe. Four other routes: The northern spur route went from the Gansu Corridor across Russia to northern Europe. A southern spur route went from Xinjiang through the Karakorum mountains to India/Pakistan. The Tea Horse Road went from Yunnan and Sichuan through Tibet to India, and the "Maritime Silk Road" went via seas to the Middle East, Africa, and Europe. 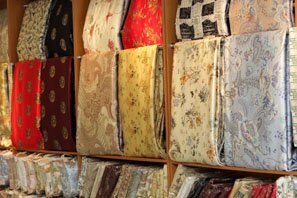 Silk fabrics were very valuable, light and easy to transport. The Han Empire initially wanted big central Asian horses for their cavalry. Initially, they mainly traded silk, but later, paper and porcelain were also exported in exchange for precious metal, glassware, woolen articles, and other products from all the way from Europe and Egypt. See more about What Was Traded on China&apos;s Silk Road and Why. This route from Xi&apos;an to Urumqi and Kashgar takes in the major cities on China&apos;s New Silk Road infrastructure expansion. Modern technology allows the economical construction of rail and road links across Eurasia. The Chinese government believes they can greatly spur China&apos;s growth and become a superpower by constructing land and sea transportation facilities to make trade and travel more economical and quicker. They have announced a trillion dollar plan that they call "1 belt 1 road" that would impact 4.4 billion people. Within a decade, it might generate trade worth more than 2.5 trillion dollars if successful. China plans to spend €500 billion (580 billion USD) for it by 2020. New trans-Asia transportation infrastructure: Substantial progress has already been made. The first freight trains from Europe to China began running in 2011 and have cut transit time from Germany to China from 50 days by sea to 18 days. In 2018, a major 5,400 kilometer highway to St. Petersburg from the Yellow Sea was opened 2018 that allows vehicles to travel the distance in 10 days. 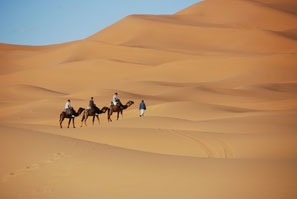 This is a new travel option for economical tourist and sightseeing along Silk Road places. 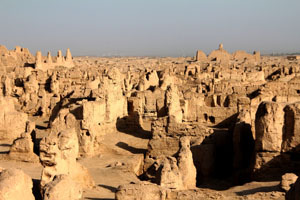 The Jiaohe Ruins, an ancient Han/Gushi Silk Road settlement, is a popular tourist sight in Turpan. In Xinjiang and along the entire Silk Road from Xi&apos;an to Kashgar and Altai Prefecture to Greece and Albania, Silk Road tourism is booming. 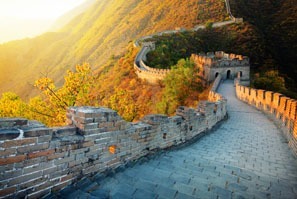 Multi-country trips tracing the Silk Road route are becoming popular among both Chinese and Westerners. 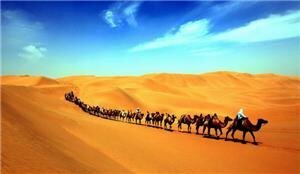 All along the Eurasian Silk Road route, travel and touring has become popular. In 2018, there were 38 percent more tourists in Altai in northwestern Xinjiang and 24 percent more in Uzbekistan than last year. Chinese tourists arriving in Albania have doubled over the previous year. For more on the attractions on the Silk Road within China, see Top Things to Do Along the Silk Road. 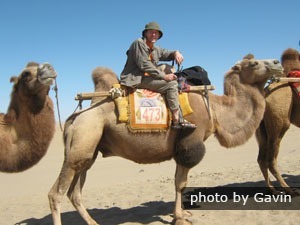 Riding a camel at Dunhuang is one of many ways to enjoy the Silk Road. Many modern day adventurers peg extended Silk Road travel in China and westwards as one of the key items in their bucket lists. 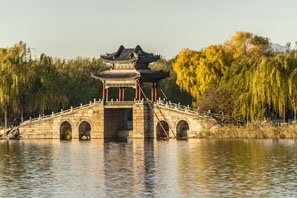 Silk Road travel is a rich cultural journey into the heart of China, and we can provide what you need for a comfortable, enjoyable, and worry-free experience designed to suit you. Our tried and tested itineraries are modifiable. 7-Day Xinjiang Silk Road Highlights Tour — In the province furthest west in China, see Urumqi, Turpan, and Kashgar&apos;s highlights. 11-Day Tour Along the Great Silk Road — Our 11-Day Xi&apos;an, Zhangye, Dunhuang, Turpan, Urumqi, and Kashgar tour is the most selected Silk Road itinerary. 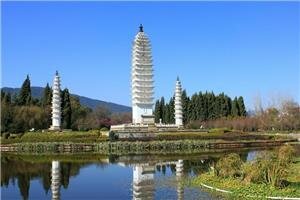 Tell us your interests and requirements, and we will tailor-make a Silk Road tour uniquely for you.